As it name states, an audio interface is a device to connect your microphones, guitar, keyboard and other audio sources to your computer. Think of it as a device for analog and digital to match-make. It works both ways, where it turns analog signals into digital and digital signals into analog. There are lots of choices to choose from when it comes to shopping for an audio interface. Some of them come built with Firewire, USB and even PCI connections. Audio interfaces comes in different sizes and prices as well – so which one really is the best and which one should you consider getting? You’ll basically need an audio interface if you want to record to your computer software using microphones, guitar or your keyboard. 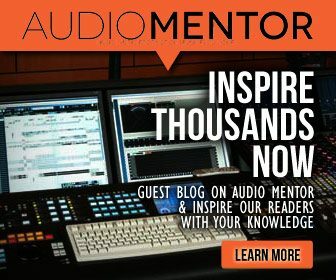 You’ll also need an audio interface if you want to connect your computer to your studio monitor speakers. Also if you’re looking for better sound quality when producing music, an audio interface is usually a must. Essentially an audio interface is a sound card on steroids, made for producers, DJs and musicians. If you’re on budget, take my advice and make sure you buy an audio interface with 2 inputs and 2 outputs as a bare minimum. Why? 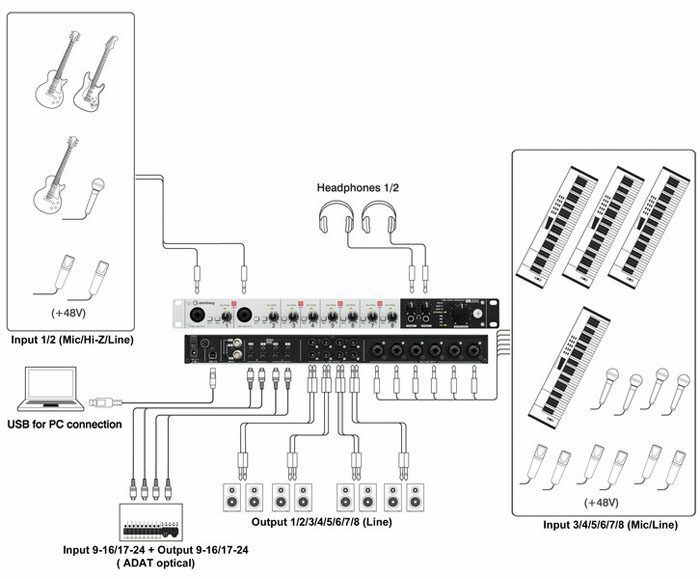 There are many different types of audio interfaces from interfaces that comes with only 1 input/2 outputs to interfaces that boasts up to 18 inputs and more. 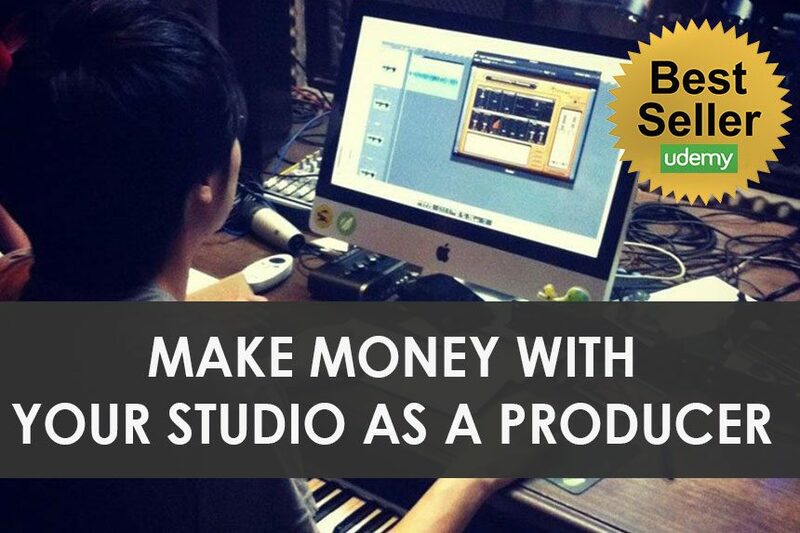 It really depends on what you’re planning to record and the style of music you produce. We’ll come to why you should buy an interface with at least 2 inputs later. 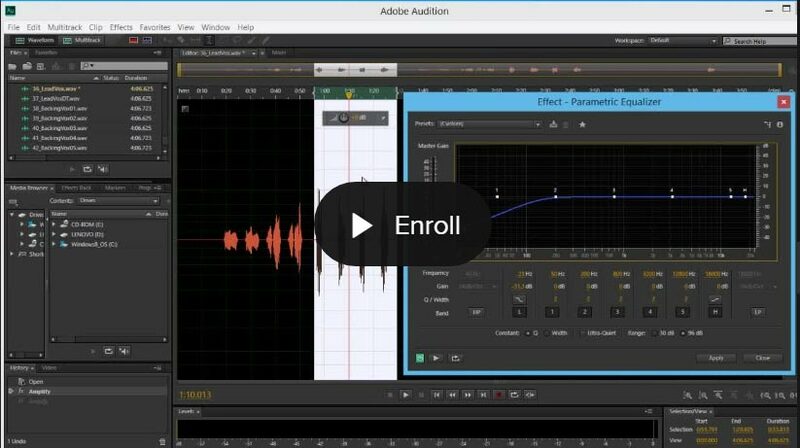 If you’re recording your own playing and performances, say using only one microphone or one instrument, you’ll only need one input. There a few types of inputs on an audio interface that you should look out for though. Instrument level instruments like the guitar will require a line-level input on the audio interface. Most audio interface would have a line level input. For microphones, you’ll need an audio interface that have a mic pre-amp built in. Also check if the audio interface has Phantom Power as you’ll need it to run condenser microphones. 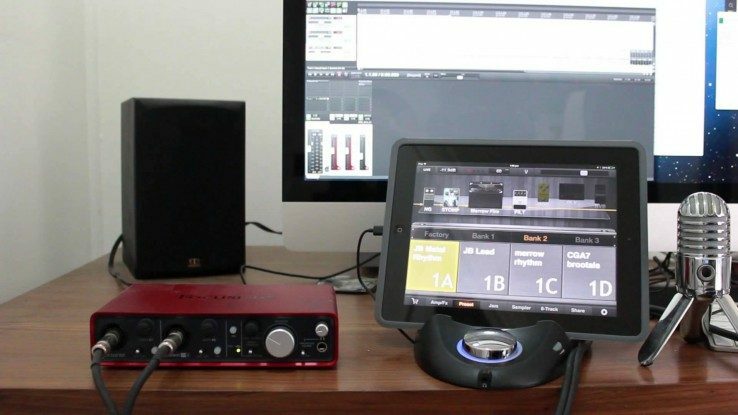 The Focusrite iTrack is a nice audio interface that works even with the iPad itself. However though it’s promoted as a 2 input device, it doesn’t record 2 inputs simultaneously. Coming back to why you’ll need at least 2 inputs (that records simultaneously) on an audio interface, it is basically because I believe 2 inputs give you bigger versatility. You might only need one input for now, but time will come when you find yourself having to record the outputs from a CD player or a keyboard which are usually stereo, meaning that you’ll need at least 2 inputs in your audio interface. Most audio interfaces these days comes with combo jacks with built in pre-amps. That means you can plug a guitar or a microphone into the same input. Being more ambitious? Well, go for the bigger audio interface that offers more inputs. Bigger audio interfaces such as the M-Audio Profire 2626 which has 8 built in pre-amps allows for expansion, where you can stack another one or two units and have over 24 mic pre-amps able to record simultaneously. The 8-input interface is probably the minimum you need to record a band. And if you’re a DJ, you can get away with an audio interface with only 2 inputs. It’s common to see 2 outputs on an audio interface. They are used to feed your monitor speakers, one for the left and the other for the right. 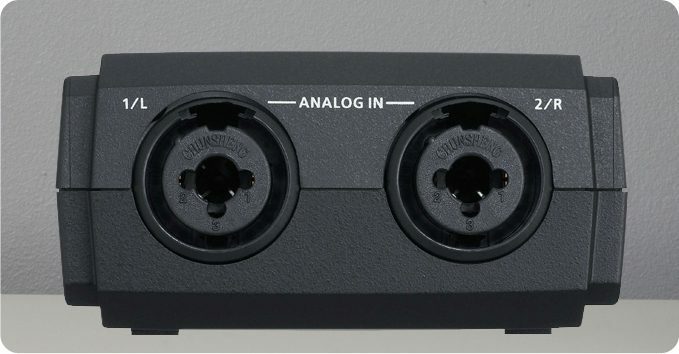 Since most products usually come with an equal number on inputs and outputs, (some of which includes Komplete Audio 6 & Presonus AudioBox 1818VSL). So what are the extra outputs for? To a band they only need 2 outputs for a stereo speaker set up, so what gives? The extra outputs you have on your audio interface are pretty useful in fact. The extra outputs on your audio interface gives you the ability to hook up your production to a 5.1 or 6.1 surround setup. If you had 8 outputs, you could have 7 speakers and 1 sub-woofer setup – giving you a surround system setup. While a singer-songwriter or band will not find this setup useful, this type of setup is essential for film composers. To choose a suitable audio interface ultimately depends on the type of music you do and you are planning to record. The most common connection you’ll find on most audio interfaces, the Universal Serial Bus is a format created to connect lots of different types of peripherals to your computer. Cameras, printers, mouse, keyboards, you name it. USB is pretty easy to operate.. Just plug it in to an available port in your computer and you audio interface should be up and running in no time. You don’t even need a power supply for your audio interface anymore as its simply being powered up by the USB. USB audio interfaces is most convenient for most producers. Try to get the latest USB 3.0 version of audio interface. Many stores would try to sell you 2.0 audio interfaces for cheap these days to quickly push their old stocks off. USB 3.0 is obviously faster than USB 2.0, so you’d want to shop for the audio interface with the fastest connection possible. The advantage of using Firewire over USB connection is that Firewire have a capacity to stream bigger audio data with lower latency. Most Firewire audio interfaces also allows expansion where you can add more units thus increasing inputs and outputs. A little care should be placed when using Firewire audio interfaces too. Always only turn the computer on after plugging in the Firewire cable. Hot-plugging an audio interface with Firewire can lead to damage on the interface. There are two types of Firewire types, Firewire 800 and Firewire 400. 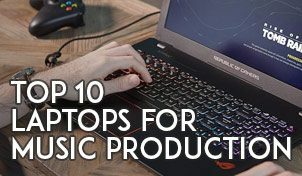 You’ll want to check the ports that your computer accepts and get an audio interface that matches the port on your computer. Apple implemented a new input and output technology called Thunderbolt. So should you care about Thunderbolt or not? The truth is Firewire is becoming quickly absolute and would one day be extinct as we foresee it. The newer Macs do not have Firewire ports built in anymore. They are replaced by Thunderbolt – the newer protocol. In the beginning, the Thunderbolt audio interfaces were expensive and considered luxury products, but turn to companies such as Apogee and you’ll be able to find audio interfaces at consumer level prices. The best type of audio interface are the PCI-e. Search the internet for proof and you’ll find claims that most producers experience the lowest latencies and be able to achieve lower buffer size with PCI-e audio interfaces. However PCI-e connections on computers are quickly becoming obsolete. You can’t find PCI connections on any Mac – not even the latest Mac Pro. You can still build a Windows based machine and add in a slot for PCI though, but the technology is slowly fading off. So should you care about Thunderbolt at all? I think you should as computers are changing fast and it is usually the company that makes audio interface who follow the evolution of computers and not the other way round. We’re looking to see PC developers implementing Light Peak, a hardware interface where Thunderbolt was built on. Which Audio Interface Should I Get? Back at the ultimate question, which audio interface should you really get? Well check out the easy guide we put up specially for you to make your decision quicker and better. Native Instruments Komplete Audio 6 – Freakin’ love this!